Definition at line 29 of file MediaTransformOutput.php. This can occur if the requested width was bigger than the source. Definition at line 167 of file MediaTransformOutput.php. Definition at line 243 of file MediaTransformOutput.php. References $attribs, $lang, $page, $params, $query, $title, file, page, and wfArrayToCgi(). Returns false for scripted transformations. Definition at line 85 of file MediaTransformOutput.php. Definition at line 76 of file MediaTransformOutput.php. Definition at line 69 of file MediaTransformOutput.php. Callers should never write to this path. Definition at line 177 of file MediaTransformOutput.php. References $path, file, isError(), FileBackend\isStoragePath(), and null. Definition at line 99 of file MediaTransformOutput.php. Definition at line 92 of file MediaTransformOutput.php. Definition at line 62 of file MediaTransformOutput.php. This will return false if there was an error, the thumbnail is to be handled client-side only, or if transformation was deferred via TRANSFORM_LATER. This file may exist as a new file in /tmp, a file in permanent storage, or even refer to the original. Definition at line 155 of file MediaTransformOutput.php. Definition at line 140 of file MediaTransformOutput.php. 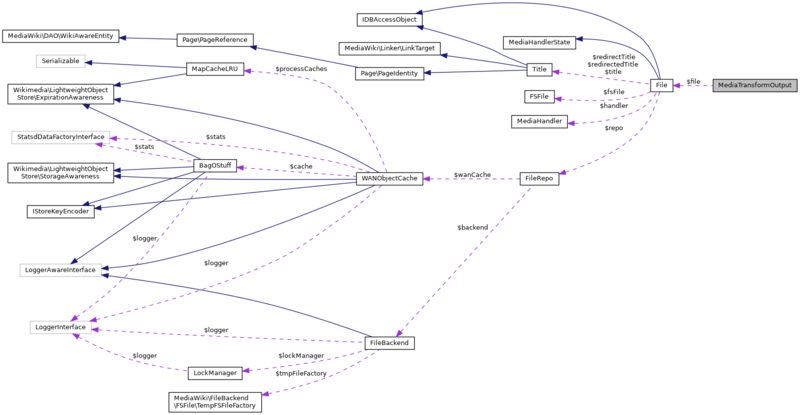 Referenced by fileIsSource(), getLocalCopyPath(), and hasFile(). Definition at line 230 of file MediaTransformOutput.php. Definition at line 107 of file MediaTransformOutput.php. References $options, $storagePath, and toHtml(). Definition at line 219 of file MediaTransformOutput.php. Definition at line 200 of file MediaTransformOutput.php. References $success, file, getLocalCopyPath(), FileBackend\isStoragePath(), StatusValue\newFatal(), StatusValue\newGood(), and StreamFile\stream(). array $options Associative array of options. Boolean options should be indicated with a value of true for true, and false or absent for false. For images, desc-link and file-link are implemented as a click-through. For sounds and videos, they may be displayed in other ways. Definition at line 36 of file MediaTransformOutput.php. Referenced by ThumbnailImage\__construct(), and getFile(). Definition at line 42 of file MediaTransformOutput.php. Referenced by MediaTransformError\__construct(), getHeight(), and ThumbnailImage\toHtml(). Definition at line 54 of file MediaTransformOutput.php. Definition at line 48 of file MediaTransformOutput.php. Definition at line 51 of file MediaTransformOutput.php. Referenced by ThumbnailImage\__construct(), and getLocalCopyPath(). Associative array mapping optional supplementary image files from pixel density (eg 1.5 or 2) to additional URLs. Definition at line 33 of file MediaTransformOutput.php. Definition at line 57 of file MediaTransformOutput.php. Referenced by getStoragePath(), and setStoragePath(). Definition at line 45 of file MediaTransformOutput.php. Referenced by ThumbnailImage\__construct(), getUrl(), and ThumbnailImage\toHtml(). Definition at line 39 of file MediaTransformOutput.php. Referenced by MediaTransformError\__construct(), getWidth(), and ThumbnailImage\toHtml().